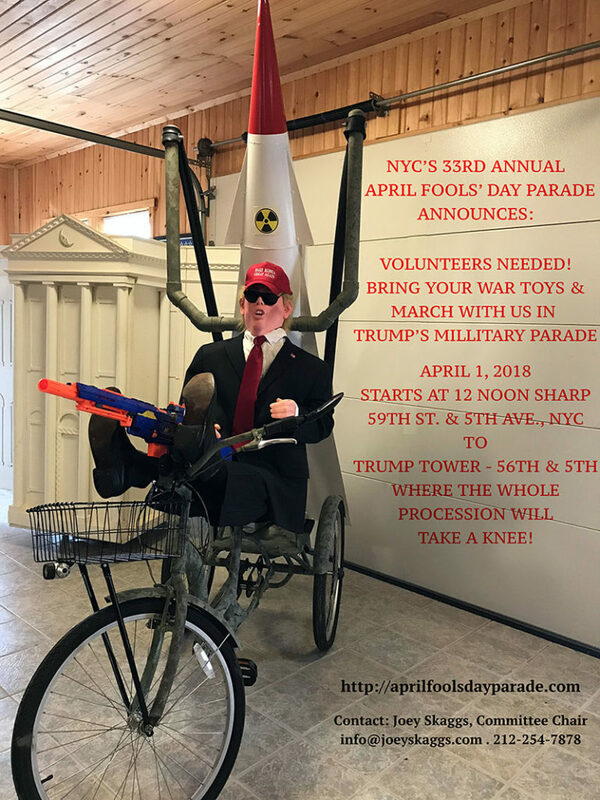 New York’s irreverent April Fools’ Day Parade returns, poking fun once again at the past year’s displays of hype, hypocrisy, deceit, bigotry, and downright foolishness. Nothing is sacred. Our satire knows no bounds. The parade this year will be a massive “TRUMP MILITARY PARADE” celebrating our president’s greatest fixation — himself. The public is encouraged to participate, in or out of costume, with or without floats, and may join the procession at any point along the parade route. Floats can be no wider than 10’ and no longer than 30’. They can be self-propelled, towed, pushed or pulled. Customized bicycles, tricycles, baby carriages and aerial balloons are welcome. The parade will start at 59th St. and Fifth Ave. at 12 noon, and will pass by Trump Tower at 12:15 pm where everyone will take a knee. The Parade Committee assumes no liability for damages caused by satire.